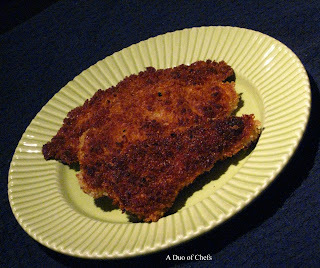 Our friend, Kayla, recently blogged about cooking some chicken strips that I thought looked great. A little while later, fellow Wisconsin blogger Alison wrote about homemade chicken nuggets. When Melissa saw the post, she was tempted to try to make some for us. So she did. We can't help but be enamored with these chicken strips. Besides the coating being delicious, tenderly spicy, the chicken was cooked perfectly. So well, in fact, that it was probably the most well-cooked chicken we've cooked at home. They were tender and juicy, and everything you want chicken to be. 1. Let the chicken soak in the buttermilk in a zip-top bag. 2. Combine the flour, pepper, chili powder, garlic salt and cumin and mix. Place that mixture on one plate (or in a bowl), and place the eggs and hot sauce mixture in a second plate. Place the panko in a third plate. 3. Dredge each chicken strip in the eggs mixture, then the flour mixture, then the panko mixture. 4. Cook over medium-high heat in canola oil.